With Kingsman and Mission: Impossible coming before it, and with Spectre soon to follow, The Man from U.N.C.L.E. is helping to make 2015 the year of the spy movie. The Man from U.N.C.L.E. is a 60s spy flick that follows CIA agent, Napoleon Solo, and KGB agent, Illya Kuryakin, as they team up to track down a secret criminal organization hellbent on obtaining nuclear weapons. While it values style over substance, The Man from U.N.C.L.E. serves as a decent spy flick that sufficiently entertains. It may not have as many high-flying thrills as one might expect from a spy movie, but it does a good job of keeping the audience engaged. Alicia Vikander as Gabby Teller, Armie Hammer as Illya Kuryakin, and Henry Cavill as Napoleon Solo. distinct tone. That tone is light-hearted, but still engaging. The Man from U.N.C.L.E. embodies the idea of “classic” in both style and tone. These different traits are really brought to life by the film’s spectacular talent. There’s no real need for Academy Award-winning actors in a film like this. All you need are people like Armie Hammer, Henry Cavill and Alicia Vikander who buy into their roles and excel at playing off of one another’s strengths. Sure, their characters aren’t really characters you’ve never seen before, but it’s almost enjoyable enough just to see them all on the same screen exchanging witty banter. My only complaint is that Hugh Grant needed way more screen time. He was probably the funniest part of the whole movie. Style always wins out over substance, and that’s not always a good thing. The Man from U.N.C.L.E isn’t just dressed up to look like a 60s spy flick; it is a 60s spy flick. No matter how much fun you end up having with the movie, you just get this nagging sense that you’ve seen it all before…in the 60s. All this leads into a story filled with predictable characters and clichés. It takes a large chunk of suspense out of the movie when you know everything that’s going to happen. This predictably does a bit of harm to the action in this movie, which tries to be fun and light-hearted, but one can only harp on that kind of action for so long. At some point, it all just gets kind of boring. This is a pretty simple review, because this is a pretty simple movie. It’s stylish and fun, but that doesn’t help the weak plot and skin-deep characters. Is The Man from U.N.C.L.E. entertaining? Yes. Is it a must-see? Nope. 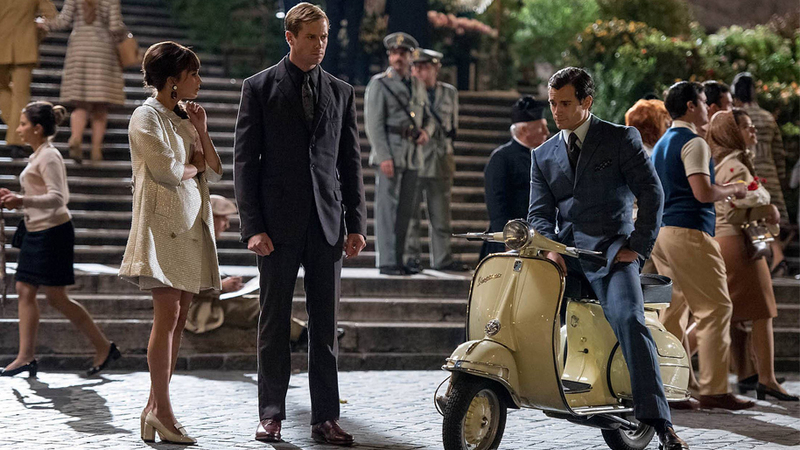 What did you think of The Man from U.N.C.L.E.? Categories: Action, Comedy, Movies, Review, SpyTags: Alicia Vikander, Armie Hammer, Guy Ritchie, Henry Cavill, Hugh Grant, The Man from U.N.C.L.E.